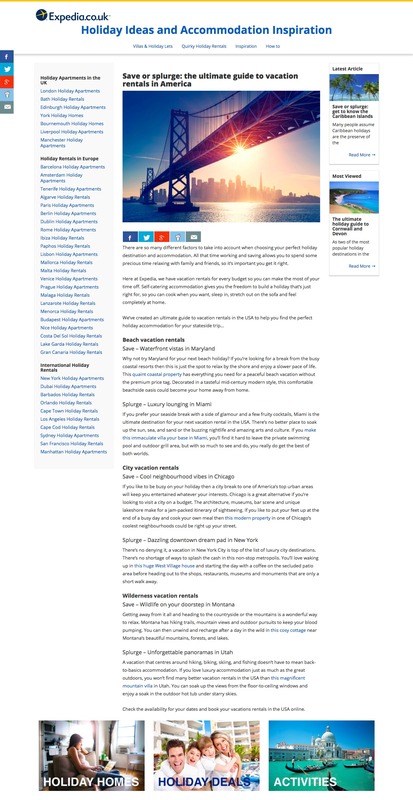 With established experience as a blog writer for UK travel industry websites, my work with Expedia was a real treat. This household name in the travel biz wanted a new content written for their blog to help promote their growing presence in the holiday rentals market. When you’re trying to introduce your loyal customers to a new product or service, showcasing your shiny new wares in a series of blog posts is a great way to boost your traffic. You can scoop up new clients that may never have used your website before, as well as bring your established customer base on board with your new products. A regular blog means you can target more keywords for increased results in SEO. You can repurpose blog posts into even more content for your social media profiles, build backlinks and increase your page views. With this blog post, I used strong header text to support the post title and found great properties for each section to link to in the body text. I love writing for the travel industry and have a real passion for creating fun, readable, clickable content that actually helps your business to grow. If you’re looking for a regular blog writer for UK travel industry web content, I’d love to hear from you. My contact form is just a click away! © 2019 Laura Imogen. Site by Maze Creative.